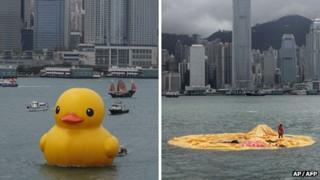 A 16m (52ft)-high rubber duck, which has attracted crowds of visitors as it travels around the world, has deflated in Hong Kong's Victoria Harbour. The giant bird, created by Dutch artist Florentijn Hofman, was found lying on its side on Tuesday night and was completely flat by Wednesday, reports say. Exhibition organisers say it is part of scheduled maintenance work. The inflatable duck was due to be towed to a shipyard for a check-up. The giant yellow sculpture has been transported around the globe since 2007, visiting cities including Sydney, Sao Paulo, and Amsterdam. It arrived in Hong Kong's Victoria Harbour on 2 May and was due to stay until 9 June. Its deflation caused disappointment in the city, where the duck has become a popular tourist attraction. "We scheduled a body check for these two days. If everything is fine we can inflate it as soon as possible and the public can appreciate it again," Andrew Yeung, a spokesman for the Harbour City shopping centre that arranged the installation, told the news agency AFP. "I know people are disappointed but we need to check the overall condition. We don't want to upset everyone." Mr Hofman has previously warned that the PVC duck would need to be deflated if it faced high winds and waves. The artist hopes the work will bring people together and encourage a connection with public art.